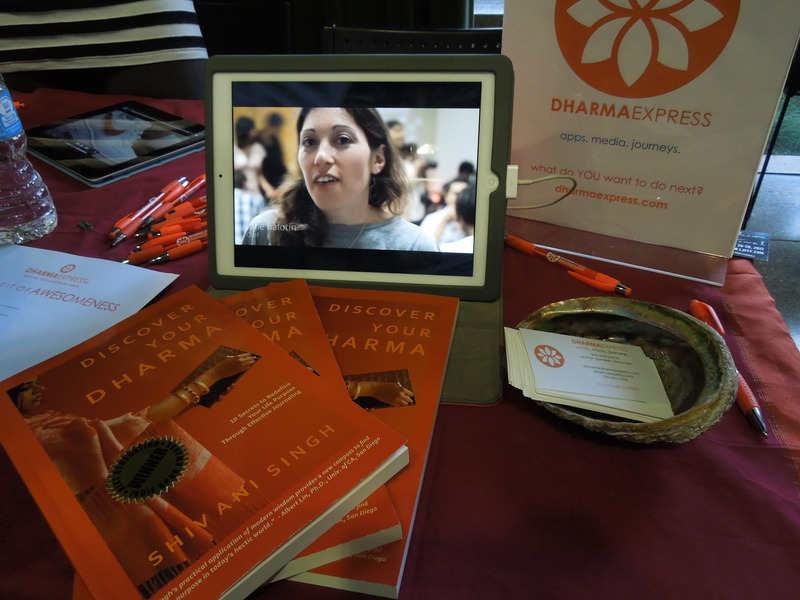 Last week I met author and CEO of the company Dharma Express, Shivani Singh. This statement is what she told me inspired her to develop a program that would help recent college graduates and people in a “slump” like she once was. This UC San Diego alumni, after searching for years after graduation to find the perfect pathway for herself, found a certain technique that could be utilized to fully determine one’s passions and personal goals. She created the simple program, named from the Sanskrit word “dharma,” meaning one’s higher purpose in life. She uses this term to express the idea that we have the capability and intelligence to make an impact on the world if we could only make that purpose more clear to us. Shivani was a Physics major who, like many college students, was in a difficult position after her undergraduate studies. Although she had been told constantly how brilliant she was, which was only reaffirmed by the position she snagged working for NASA, she still did not feel like she was using all that she had to offer in life. After 3 years of being on the nine to five work schedule, she admitted to “feeling mechanical,” and that she had lost her passion for a dream she had since she was little. She knew that she could not be the only one who felt this way, which left her frustrated at the fact that many of her classmates and coworkers were now settling for less than they could accomplish. So she left her job to travel and learn about the world, including a trip to India where she was first introduced to the concept of dharma. However, after all of this, she was still somewhat unsatisfied. So, in an attempt to find out “the secret,” Singh read books from many of her personal heroes such as Mother Teresa, Ghandi and Pablo Picasso–people that she believed changed the world. Among all of her readings, she discovered the common denominator to be the simple act of journaling. By getting their thoughts out on paper, these brilliant minds were able to organize their character in a way that helped them to realize the pathway they wanted to take. Shivani then began to work with neuroscientists at UC San Diego, where she decided to continue her education to flesh out a plan even more, dovetailing the journaling technique with listening to music at certain intervals. Using music to trigger certain emotions and reactions in one’s brain is not a new concept, but the research done at UCSD helped to narrow it down to a specific regimen that would ultimately create the unique process that Dharma Express promotes today. Discover Your Dharma, is the book which outlines the way that her program can help the gifted scholars and minds around her to do exactly that. After writing it, her company began developing other platforms and forms of technology, such as web apps and blogs, which would spread her coaching sessions to reach large audiences. Shivani Singh still travels around to universities, hoping to specifically guide college students that she knows are facing the all too comon dillemma of asking, “What next?” Because, although it is pretty common knowledge that university graduates have got some serious brains, sometimes the secret lies in figuring out exactly what to do with them. A recent article in Forbes.com listed a few key tips for college grads in hoping to land a job. Because employers are looking to hire a good number of their future employees from the class of 2012, the article is an effort to prepare seniors for what to expect when looking for a job. Upon reading this very informative advice, I could not help but notice that for every single step listed, I had an accompanying interview horror story in which I had done the complete opposite. I had gone in for my dream job, knowing practically nothing about the logistics of the company at which I was applying. When I was flat-out turned down on the spot, I moped around all summer without even attempting to interview for another position. I had arrived 40 minutes late to one interview, and in another had worn denim jeans while everyone was in a suit and tie. It made me wonder, where was this list when I was tongue-tied in front of an intimidating hirer? More importantly, where was everyone else getting their advice? What was the secret? Was everyone as lost as I was? Apparently so. Among most of my classmates, most of them had never been to an official interview, and those who had, claimed to not knowing much going in other than the fact that one should, “dress nice.” Although, after asking for further clarification, not many of them even knew what that meant exactly. Enter, Alexa in blue jeans. Many were in the same boat as myself, picking up fragmented information from word of mouth and television shows, but not understanding that finding a job is much more tactical than it appears. One student in particular, when asked how he prepared for his first interview, replied with a slight shrug, saying, “I just winged it. Probably why I didn’t get the job.” Finding this solidarity amongst my fellow clueless classmates admittedly put me at ease. On the other hand, I once was talking to an alumni of my high school who is now a pretty successful slam poet. He revealed to me that his first job was working in a lab, with some long and official-sounding title. I asked him what it meant, and he laughed, telling me that to this day, he still had no idea. He tried his best to convince me all he needed was to go in with no inhibitions, and from there he “just got them to like him.” I was astounded. Sure, he had an infectious personality and carried himself very well, but I was amazed (and highly dissatisfied with the lack of a “real” explanation) that his simple demeanor could get him hired on the spot. Which brings me to the other interesting facet about this article, that none of it was spent giving advice about answering the actual questions during an interview. This, I had always assumed to be the most important part. Before my first interview, I had scoured the web for generic sample questions that I thought would surely be asked of me, so that I could give the most brilliant and eloquent responses and impress an employer. Of course, they never were. Instead, Forbes stresses how having knowledge of oneself as well as the confidence to showcase it was key to leaving a good impression, not having all the right answers. This explains why clearly unqualified people can sometimes land the job, and why many socially awkward college grads from highly ranked colleges may feel frustrated that their bulky resumes are getting them no where. Essentially, the secret to having a great interview is that there are no secrets. It is a game of the draw, and the best one can do is go in with a positive outlook and leave with one as well, hired or not. Although preparation is key, the important part to draw from this article is that the advice is purely that: advice. Helpful to read, but ultimately one’s preparedness will come from getting to know yourself and your own habits, and knowing that even if you know all of the right answers, you’re still not going to get the job in tattered blue jeans.